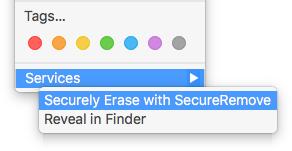 SecureRemove - The permanent file eraser for MAC OS X.
Don’t let your sensitive data fall into the wrong hands. With SecureRemove you permanently wipe your data and erase your files fast and easily. When you normally delete files or empty the trashcan, your files are not really deleted. The operation system just mark these files as 'erased' and will be overwritten some day when the system needs more disk space, but in the meantime these files are still recoverable with a simple or advanced undelete tool. This is crucial for sensitive data that you definitely need to erase. Secure Remove is the solution. It completely wipes all the data using military standard algorithms and makes sure that erased files are definitely erased. Forever !! SecureRemove supports 10 wiping algorithms. From fast single pass to complex 35 pass algorithms. Including the US Department of Defense standards, German Federal Office and Russian Federation standards. You can easily drag and drop your files and folders into SecureRemove. Even on the fly during wiping. SecureRemove is fully integrated in Finder. 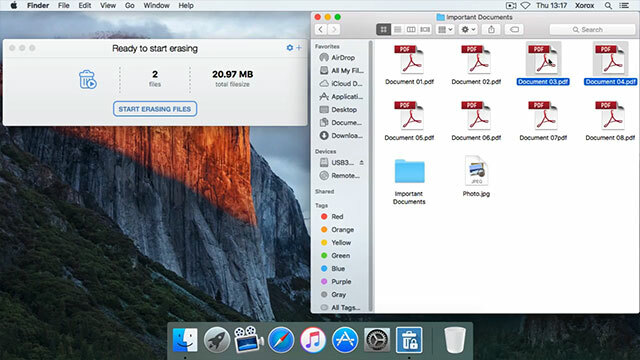 Just select your files and folders in Finder and use the submenu to securely erase them. To avoid interruption of the wipe process, SecureRemove automatically update the file attributes for files that are locked or flagged as readonly were possible. Erase your sensitive files fast and secure. Copyright 2015-2019 XoroxSoft. All Rights Reserved.